Amazing … how did you get hold on a gem like this from denmark? Friends like you all around the world. God has blessed me with fine people who also appeciate some really great music. I am seeking to bless all my readers with some of the best music from around the world. The first time I heard this album I knew it was something that others would enjoy. 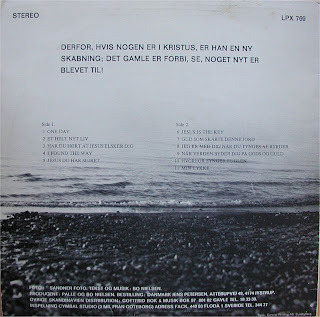 I was also aware that Denmark did not have any entries in “The Archivist” by Ken Scott so I present to the world, a world class album from Denmark. I shall try to find some more from here. In 72 we were all young and spent our time in the streets of copenhagen singing and telling our fellow citizens about the good news. As a matter of fact the Bo part is today my brother-in-law. My father had the album, he collected a lot in the 70’s and 80’s, has a collection of about 2200 vinyls from all over. Including this one. Watch out, there is a Fareo Island gem too (I think!!). If you have any of that kind of stuff from that period I would be very, very grateful. Not quite my bag though there are four lovely tracks on the album. 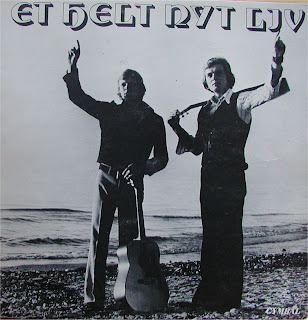 I find that albums from Holland and Scandinavia are such a hit or miss affair. Sometimes they are utterly fantastic, other times they aren’t at all progressive and end up being quite conservative, which, for various reasons, surprizes me. I was, for example, surprized to read that the ages of the two guys on here are 18 and 21 as the music is, ah, “mature”. I tell you what though, I respect them for it. And with Jorgen, I am interested in anything from that era.